This is a repost of a piece I published on Medium on Friday, May 20. Oops, it’s actually not that funny. But it has a good ending. The magazine editor survives , and faces her problem, and in the course of staring it down in the face learns that it’s actually not just her problem at all. It’s the problem of a culture — one that she unintentionally helped promote for many years as a member of the media who endorsed the normalization and glamorization of drinking. Spoiler alert (magazine editors love to use that phrase): she’s me. If you’ve read anything I’ve written in the past year, you know that. If not, well welcome. Why do I tell my story, and keep telling it? Because today there are women out there suffering today, asking themselves “Do I drink too much?” and then saying to themselves, “It can’t be a problem. It’s normal.” Can you blame these women? They are bombarded with images of just how normal it is to not just want but to need a drink. The latest example? 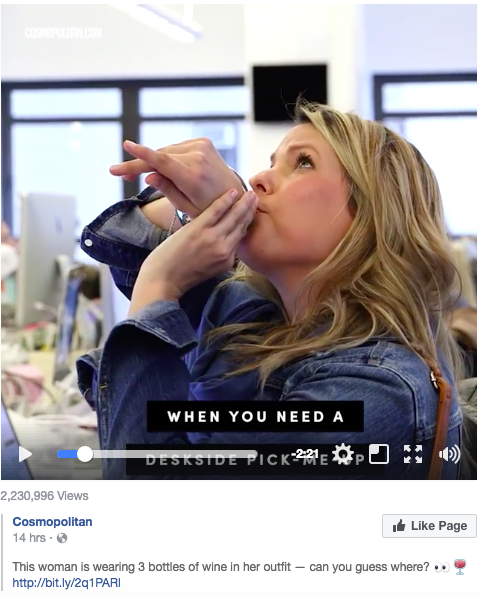 This Cosmopolitan story called “I Hid Three Bottles of Wine in My Clothing And Nobody Noticed.” The story was based on the fact that there are a slew of new products for women to sneak their booze. It also had a video component demonstrating all the ways a woman can hide three bottles of wine in her outfit. Her bra! Her bracelet! Her shoe! Her scarf! Then it takes us through various scenarios during the day in which she drinks without anyone knowing it — at Starbucks, during a meeting, and in the elevator. It goes on and on. Blonde, happy, productive. What could go wrong? I saw this post on my friend Holly’s Facebook page, Hip Sobriety. In 2015, a year after my personal indication that yes-there-might-be-a-problem, I entered recovery with Holly’s help. I was lifted up and encouraged by many other women like us, whose stories were achingly familiar: young, conventionally successful, and dying on the inside. Alcohol is the most commonly used addictive substance in the US. One in 12 of us suffer from alcohol abuse and dependence. Millions more engage in risky binge drinking problems that could lead to alcohol problems. I don’t know what your relationship is to alcohol — maybe it’s great. I can only share my story. It was great too, and then it wasn’t. And even if you can drink without repercussions, a lot of us, and I mean a lot, can’t. Here’s the thing — there was a point not too long ago where, as an editor, I would have green lit a video like the one Cosmopolitan made. I’ve written before about how the media reinforces the story that alcohol represents carefree living, freedom and empowerment. I know why writers/content creators pitch these ideas, and why editors approve them. Even if unintentionally, this story sends powerful images. Intentional or not, cheeky as it tries to be, it shows that it’s OK to hide your booze in a bangle. But why? Isn’t there enough outright access to rose? Why would you need to drink at your desk, or anywhere else in secret? If an activity or event is so intolerable you need to drink, could something else be going on? Is that not it? Is it just that drinking is fun and I’m the one with the problem? Maybe, but I don’t think so. I think we’re all together in this, and I’d like my media sisters and brothers to step up in considering how they frame the alcohol narrative. Cosmo’s current Facebook header promotes this activism hashtag: #activismirl, with calls to action to empower its readers to initiate change in their worlds. Encouraging dialogue about the cultural narrative around alcohol is part of how I initiate change in the world. Some of my lowest drinking moments came during the years in which I was also part of the problem — spreading images and words surrounding the glamorous glass. So I say today: if you’re a part of the media, please re-think the alcohol narrative. If you make content of any kind, please re-think the alcohol narrative. Let’s be done hiding. Let’s start talking.